Blurb: On the hostile planet of Kembel, a crash-landed craft from Earth is desperate to escape. But for SSS Agent Marc Cory, survival is not the only matter at stake. He is acting on a warning that alien craft have been seen approaching Earth's Solar System - craft matching the description of Dalek vessels. He is sure that the planet Kembel holds the key to their plans. His hunch proves correct. Hidden on the planet, the Daleks are conspiring with delegates from the outer galaxies to raise an invasion fleet to the destroy the Solar System - with Earth as the first target. Can Cory escape with his life and warn Earth of the danger it races? Or is the Daleks' master plan already too advanced to stop? Format: Television drama transmitted on October 9, 1965. It is currently missing from the BBC archives. Episodes 3 was released with a truncated reconstruction of the remaining episodes based on the existing audio and pictures on the Aztecs: Special Edition DVD released on March 12, 2013. I watched the story as part of the Loose Canon series of telesnap reconstructions LC13 released in September of 2000. The BBC has also made the audio for the story available on CD, which was recorded by fans at the time off air. 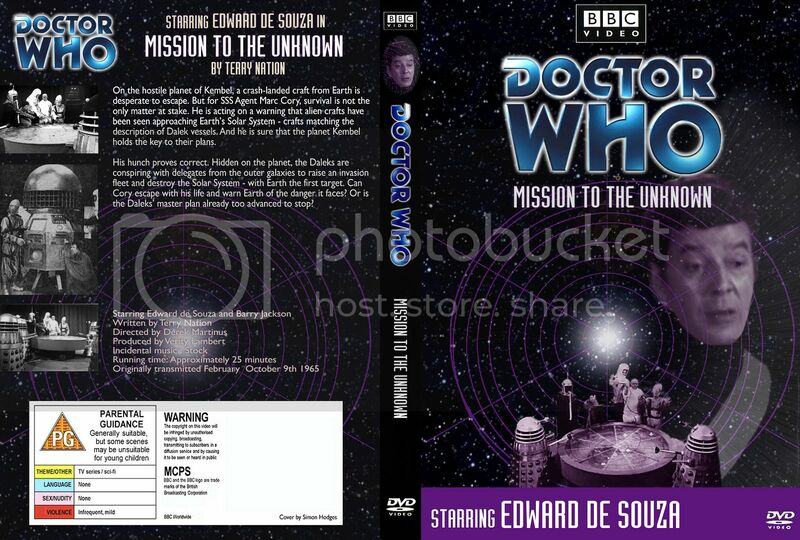 The CD has linking narration by Peter Purves to explain any visuals lost on the audio. Setting: The planet Kembel somewhere in the Milky Way Galaxy in either late 3999 or early 4000 AD (this story takes place six months prior to The Daleks Masterplan). Continuity: The Dalek Invasion of Earth is mentioned although they say that it happened about 1000 years ago when 1800 is closer (see The Dalek Invasion of Earth). DVD: The Loose Cannon reconstruction comes with an opening and closing set of comments by Edward de Souza who starred as Marc Cory in this story. There is also a reunion of the three cast members - Edward de Souza, Jeremy Young, and Barry Jackson who discuss their careers and memories of this story. Discussion: Mission to the Unknown is a bit of a strange thing in Doctor Who. It didn't follow the normal serial format of the classic series and instead was a self-contained 25 minute story. Even stranger neither the Doctor nor any of his companions appear in it. Depending on who you ask this story was either conceived as a 25-minute long commercial for the epic Daleks Masterplan that was coming up or as a space-filler to fulfill some contractual obligations. What had happened is that season 2 ran one episode short because Planet of Giants had been cut from four episodes to three. The cut happened after recording so the regulars had done their allotted number of episodes but there was a gap in the television schedule due to the missing episode. This episode was made both as a tie-in to the upcoming mammoth story but also to fill in the missing episode slot with a story that didn't feature any of the regulars. Nowadays something like this would be a minisode available online or something along those lines to drum up interest in an upcoming story, so this really is just a strange artefact of its time. One of the things that I am forced to ask when evaluating this story is whether it works or not. Trying to place it in context it does seem strange. Although this was the last episode recorded as part of the second production block it was aired as the fifth episode of the third season. That means that there wasn't a long time between when this aired and when the Daleks Masterplan aired. Yet, there doesn't appear to have been any announcement or any advertising that this was a teaser for the upcoming story, so this must have seemed really confusing for anyone watching this single episode story without the Doctor and companions and then going into a story next week, which had nothing to do with it and not knowing that the rest of the story would play out in the following month. If this had aired as the last episode in the second season and then the Daleks Masterplan had been the first story of the third season then this would have been the perfect cliffhanger setup for that other story, but it was not to be. A lot of people these days insist on listening to the two together but I'm trying to experience the series as people who viewed it at the time would have so I'm preserving the order and have watched this right after Galaxy Four. The plot is rather simple but it works well enough. In some ways I imagine that this benefits from existing only on audio because we can imagine the story being much bigger than it probably was in actuality. Made as a single episode at the end of the second production block I have a feeling that there wasn't much in the way of sets and that this was a very minimalist piece. Most of it is just Cory and Lowery talking so that he can explain the situation to him. There's certainly a tension to the atmosphere of the story as you find out about the danger of the Varga plants, the presence of the Daleks, and finally that the Daleks are forming an alliance with other unsavory alien powers. It all culminates in Lowery being infected by the Vargas and Cory on his own trying to send the message to Earth. Only, he never gets a chance as the Daleks gun him down. The downbeat ending must have been a shock at the time and it certainly is impressive as we haven't had the villains win since The Aztecs and it will remain a very rare occurrence in Doctor Who. One thing that I thought didn't work at all was the canned music that was used. I realize that as a single episode it probably didn't have much of a budget but it's such stock 50's/early 60's B-movie sci-fi music that it's just really hard to take. It's way to stereotypical. The acting is also a little on the weak side, but I almost give this a pilot's pass because none of the regulars are in this one so it's almost like they're making a completely new series and the material doesn't allow for much dynamic action as most of the story is just two guys talking and cutting to the Daleks' meeting in which only one of the delegates has speaking lines. There are some plot flaws in this story. If Cory suspects that this is the Daleks base then why does he have Garvey traipse off in the jungle on his own? One would think that he should be the one helping Lowery repair the ship. Why wouldn't Cory tell anyone that he was going on such a dangerous mission? I suppose that he could have suspected that someone in the SSS was working with the Daleks or maybe even Chen himself but it's not really said anywhere here. Maybe this is addressed in Masterplan. I don't recall. We're told that Vargas only grow on Skaro but then we're told that they're experimental and made in laboratories. Well surely if they're made in laboratories then they can be brought anywhere, right? There's a lot of confusion about the terms "solar system", "constellation", and "galaxy". It seems that the Earth's Solar System is a discreet political unit in this time but is also influential throughout the entire galaxy. This would seem to imply that the Federation is still in effect in this time (see The Curse of Peladon and The Monster of Peladon). Nothing is clear though because it's all very confused. The strangest thing is that the Daleks know that there are intruders on Kembel yet still insist on broadcasting their plans over the city's loudspeakers. This allows Cory to hear of the plans but it remains probably the weakest part of the plot. I get that they're confident that they can kill him but it seems the height of stupidity to leave something this important to chance. Recommendation: It's a tense little vignette. As an experiment I think that it works overall. It's an exciting little story that helps to set up the situation for a much larger story and it does that job admirably. Some of the acting is wooden and the music is unintentionally hilarious but it's a solid story with a downbeat ending. I rather like it and recommend it.